Description This scene is characteristic of “istoriato” (with histories or narratives) wares, and is taken from the story of Perseus and Andromeda, told by the Roman poet Ovid (43 BCE—17AD) in his “Metamorphoses.” On the left, Perseus holds the head of Medusa. In the middle, a sea monster, sent by the sea-god Poseidon to eat Andromeda, stands with its mouth open. On the right, Andromeda is trapped by a tree. Andromeda was later rescued by Perseus, who slew the beast. The back is painted white with three concentric yellow circles and one raised circle at the rim. 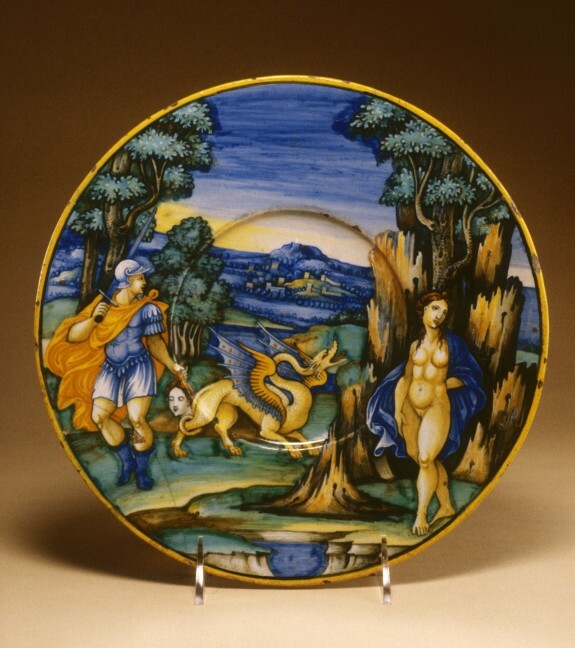 This plate was made by the Milan Marsyas Painter, identified as the artist responsible for a group of works depicting the mythological flute-player Marsyas, now in the Castello Sforzesco in Milan. During his career, the Milan Marsyas Painter worked closely with two other prominent maiolica painters, Nicola da Urbino (ca. 1480-1540/47) and Francesco Xanto Avelli (ca. 1487-1542). Like other “istoriato” (tells a story) painters, the Milan Marsyas Painter was influenced by printed images, and the scene represented here was likely derived from a woodcut in a popular Venetian edition (1497) of “The Metamorphoses.” For more works by the Milan Marsyas Painter, click on the name in the creator field; for information on the “istoriato” style, see 48.1487; for more on “maiolica” see 48.1336. Provenance Mrs. M. R. McGarel [date and mode of acquisition unknown]; Mrs. M. R. McGarel Collection Sale, Christie, Manson and Woods, London, July 17, 1913, no. 78; Henry Walters, Baltimore, 1917, by purchase; Walters Art Museum, 1931, by bequest.